With much effort Katharina has rebuilt the manor (farm) Wachsdorf; also Zülsdorf was not untroubled by the destruction of the war. In the meantime both farms were in such a way overtaxed, that Katherina had to complain several times about this. She was burdened too by a conflict with a neighbour in Zülsdorf and and had to go several times with Melanchthon to Leipzig because this broken out lawsuit. The financial burdens were no longer viable. Therefore Johannes had to assist often as oldest son of the mother in farming, that was very important for the subsistance of the family and for the further education of his siblings. Melanchthon's son-in-law and rector of the University of Königsberg, Georg Sabinus, came to Wittenberg at the beginning of the year 1549. At the behest of Duke Albrecht of Prussia he served an invitation for luther's son Johannes to continue his studies in Eastern Prussia provided by a grant of the Duke. The Reformer gave to the Duke once the spiritual food, so he found it an obligation, to give to Luther's children fleshly food and to bring forward their education. In Prussia the bishop of Samland, Georg of Polenz, established already since the year 1522 Luther's writings. In the year 1523 Duke Albrecht visited D. Martin Luther in Wittenberg and requested for his advice. At that time, Albrecht was still High-Master of the German Order, that was threatened by an increasing number of internal disintegration. The religious state was impact by a high overtaxing, the cavalry, like the knighthood was called at that time, and by a spreading malpractice of indulgence. Luther advised him to convert the relgious state to a secular principality. Therefore in the peace of Krakow on 9 April 1525 under the agreement of King Sigismund of Poland the Duchy of Prussia was created. As Duke, Albrecht instituted the reformation as first Lutheran prince. In June 1526 he married Dorothea the daughter of King Christian II. of Denmark. Duke Albrecht has invited Luther to the wedding ceremony in Königsberg, if he is followed this invitation, is cast into doubt; such a long journey would probably have required two months. The 'postil' of Martin Luther, his collection of sermons, was brought since March 1526 to all pastors in Prussia. The Duke let translate its for the Polish and the Lithuanian part of his country. The Albertinum, since 17. August 1544 the University of Königsberg, where later Kant was an excellant scholar, arised out of the "Kneiphöfischen" cathedral school. It was built up and developed by Duke Albrecht with high investments. Its humanistic teaching method followed essentially the principles of Melanchthon. All of the students there should take high offices. - The old religious state firmed after the introduction of the Reformation. Therefore Luther is the real spiritual father of Prussia, with that the roots were set for the following kingdom. End of May 1549 Sabinus and Johannes Luther hit the road to Königsberg, that they reached end of June. Because in Königsberg the Plague was erupted, they could enter the city and therefore they travelled about the duchy. Some time they stayed in Laptau; Frauenburg, the city, where Kopernikus was domiciled till his death, had still a Catholic canon, why they could not stay there. Finally both remained for some time in Prussian Holland, where Wolf of Kunheim was governor. Related to him was Johannes of Creutzen, Prussian chancellor and professor of law. Not until the winter semester 1549/50 Johannes could continue his study of law in Königsberg. Still the university was very small. In the winter semester only eight students were studying there, in the following summer semester 38 students there were. All the more the contact was closely between the professors and the students. Johannes stayed with Sabinus. He could give the merchants, which were on the way to the fair of Leipzig, the first reports of his trip to take with. Melanchthon has answered him in November 1549. Johannes Luther had a good contact to the pastor Michael Stiefel, who was a faithful follower of the Reformer. He resided in Haffstrom at the Vistula Lagoon near Königsberg. Often Johannes Luther took a walk to pastor Stiefel, and in the winter time both hiked together on the frozen backwater. Also the young Georg of Kunheim Johannes Luther met at the University of Königsberg. Those was barely ten years old as his father has died 1543. Duke Albrecht took care for him. He had promised to the father to take care for Georg like for his own son. Georg's mother, Margarete Truchseß of Wetzhausen, was the sister of the wife of Georg of Polenz, the first Lutheran bishop of Samland. Georg's guardians were Christoph of Creutzen, married with the daughter Dorothea of the bishop, and the brother of him Johannes of Creutzen, professor of law in Königsberg. Through this Johannes Luther came in close contact with this families in Eastern Prussia , which were all great admirers of his father, the Reformer. Georg of Kunheim attended primarily theological lectures at Osiander. In fall 1550 the Duke decided, that Georg had to continue his studies at the University of Wittenberg, especially to attend lectures at Melanchthon. Here Georg stayed with Paul Eber and was a boarder in the Black Monastry at the reformer's widow, Katharina Luther. He make friends with the daughter of the Reformer Margareta and became acquainted with the brother of her Martin, who studied theology too. Their brother Paul now began his medical studies on the advice of his guardian, the physician Dr. Ratzeberger. Also Melanchthon considered him as suitable. In the meantime Lucas Cranach the younger has took over the painter's shop of his 78 years old father. At the beginning 1550 his wife Barbara Brück, the sister of the saxonian chancellor Christian Brück, was died. At the end of the year Lucas Cranach the younger married Magdalene Schurff, the daughter of Luther's family doctor and niece of Melanchthon. Katharina Luther felt sickly, and in particular she yearned highly for her distant favorite son Johannes. She turned in a letter to the Duke Albrecht of Prussia and asked him, he may allow, that Johannes continue his studies of law in Italy or France. The universities of there had at this time an outstanding reputation concerning studying of law. In previous years the Duke has supported too such kind of studies abroad, but now he meant, the universities in Germany would be sufficed, its would be become equal, and therefore a temporary studying abroad would be not very useful for Johannes. Katharina would have liked, that her son could have made experiences abroad, because the journey to Königsberg was the first longer trip and absence from Wittenberg, if one turned a blind eye to the short tours, which he had made together with his father. When Johannes Luther went to Königsberg to continue his studies, Justus Jonas provided him with a recommendatory letter for the Duke; Melanchthon presented him a glowing testimony too, in what he praised Johannes's spirit and eloquence, he would be versatile and perserving in physical strains, above all he has a modest manner. 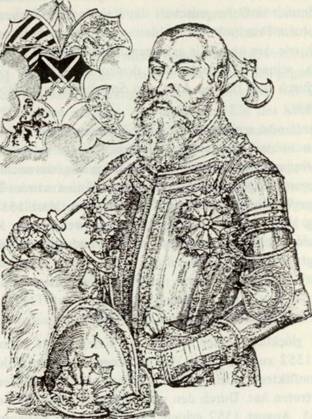 The Duke replied to Katharina's letter in July 1551, in which he complained, that his good will would be not quite reciprocated in a way, like he had hoped, because Johannes had partaked in some good conflicts. With good conflicts he probably meant, that Johannes will have represented in disputes about the doctrines of justification the Wittenbergian positions of his father and of Melanchthon, whereas the Duke favored the views of Osiander. In spite of that the Duke pointed out, he would be still gracious to her and the son, especially for her dormant in God husband's sake. Johannes became close friends with Burgrave Achatius at Dohna too, who was likewise an opponent of Osiander's views. Both received the leaving certificate of the University at 15. July 1551. Afterwards they stayed still some weeks at the family residence of the Dohna in Mohrungen. From here they started their journey to Wittenberg, that they reached in September. Achatius was matriculated at 8. October at the University of Wittenberg and continued together with Johannes Luther his studies. Board and lodging Achatius at Dohna took at Katharina Luther. Now they were again together with Georg of Kunheim, who had took up an adverse stance over Osiander's views in the Königsbergian disputes too. In nearly all German territorial states there were still unrests. Troops moved cross-country, in doing so its had left its marks and damages behind. Already in July 1547 the Emperor had imposed the ban of the Empire and he had let besieged the city. Johann Albrecht, the brother of Duke Albrecht of Prussia, was at that time archbishop of Magdeburg, to which belonged Halberstadt too. Since October 1550 a year of siege passed, afterwards Duke Moritz of Saxony has accorded alleviated conditions of surrender. The Lutheran creed was allowed, the privileges of the city and the fortifications should be maintained. At 9. November 1551 he entered in Magdeburg and united the mercs there with the troops, which had besieged Magdeburg, and which had to be furthermore under arms. Now the Duke allied with the Duke Albrecht of Prussia as well as with the Elector Joachim II. of Brandenburg, whose son Sigismund became archbishop of Magdeburg. This strategic alliance was directed against the attempts of the Emperor to establish a Habsburgian monarchy. Also Bavaria and Mecklenburg affiliated to this opposition, even the Emperor's brother, King Ferdinand of Bohemia and Hungary faced up to the attempts to create an institutional Habsburgian rule. In January 1552 the opposition of princes allied with King Henry II. of France, to whom in return was transfered the dioceses Cambrai, Metz, Toul and Verdun. The Duke Johann Friedrich of Saxony, who was still in the captivity of the Emperor, was set free by Duke Moritz, just as the imprisoned Landgrave Philipp of Hesse, his father-in-law, whose insidious capture by Duke Alba of Spain was a thorn in his side. Strong troops of lansquenets were concentrated and moved forward to the South. The Emperor stayed in Innsbruck. The troops moved forward to Augsburg, which was won by default after some few days of siege. So the way to the County Tyrol was free. In March 1552 Duke Moritz moved forward to Innsbruck, which was abondoned by the Emperor. He was fallen ill heavily and therefore he was carried along to Villach in the Duchy Carinthia. Also Innsbruck capitulated untroubled to the opposition of princes. Now one feared a moving forward to Trient, why the council, that was holding a meeting there, disintegrated hurriedly. This happy, more peaceful war led in April 1552 to the first negotiations on the settlement of the conflict in Linz, where King Ferdinand has acted for Emperor Carl V. By following Treaty of Passau at 15. August 1552 the Lutheran Religion obtained its complete freedom; the absolute claims of power of the House Habsburg were rejected. Emperor Carl V. ratified in Augsburg the contracted agreements, but because his reluctance he has after his signing destroyed the pen. With the allowance of the Emperor Johann Friedrich of Saxony could use furthermore the title Elector. He returned from Augsburg over Nuremberg in his country. In Coburg, Eisenach and Saalfeld a large crowd of his people congegrated and cheered him. At his entrance in Weimar above in the heaven a white cross shall have been visible as sign of God's grace. Henceforth he was called Johann Friedrich the Pious by the Lutheran Church. The resulting sovereignty of the princes Duke Moritz justified with a call: 'We have had to watch the current pitiable state of our adored fatherland. We have seen, how the Germans were covered all over the country with foreign troops against the oath of the Emperor, how their rights and their security were injured, how one wanted to bring the German nation to intolerable, brutish, heritable servitude, soccage and subserviency.' The revolt of the princes was supported by France, not oriented against the Empire, but it was self-defense to free from the stranglehood of the increasing Habsburgian power. For the campaign against the Emperor Duke Moritz has pulled his troops from Wittenberg. The populace could respire, because the troops, although its were not hostile, burdened the city with its raw and rough manners. Outside the city walls the gardens and fields have been devastated. Therefore Katharina Luther in spring 1552 has to struggle again to bring out the seed. A big help was her daughter Margareta, that became already acquainted young with farming. Severe storms and big rains hampered the work in the fields. With the summer heat the Plague come back into the city, where it, because of the warm humid meadows in the neighborhood of the Elbe river, liked to rule. Some students went to Frankfurt/Oder, among them also Georg of Kunheim, and continued there their studies. The University was temporarily outsourced to Torgau in the discalced monastry and was housed in its small, rambling rooms. Some professors remained in Wittenberg, especially from the medical faculty, where they has lectured in Luther's Black Monastry. Therefore Paul Luther could remain in the city together with his sister at the mother, yet his brother went along to Torgau. In this summer Johannes Luther has finished his studies and has travelled to Leipzig. Katharina wanted to leave definitely Wittenberg not till then, if the fields are tilled and the harvest is brought in. The now 53 years old Katharina felt, that her health was not very well. The many burdens of life and the hard work always made its impact. When in September the Plague had not been given way, she packed on the car the most essential things to relocate to Torgau together with Paul and Margarete in a house near the minster, that was offered her. Shortly before Torgau the horses shied, the car skidded and jolted on the uneven road. Katharina jumped from the car to hold the horses, therewith son and daughter don't run in mischief. At this she came down unfortunately, that she was wounded badly and furthermore she was soaked completely, because she had fallen into the water-filled ditch. Son and Daughter brought the cartload to Torgau, where Katharina was confined to bed. A severe cold didn't left her for weeks.